First read this wonderful post, Ends and beginnings, by Theophrastus. And also read the inspired and inspiring, personal comments of Victoria and Courtney. Here’s my own response. My wife and I have grown up in the Southern Baptist tradition, her father a preacher, a “home missionary” from Texas to Washington state and then California, and my dad also a preacher but a “foreign missionary” from the USA to South Vietnam and Indonesia. We both were raised going to church Sunday mornings for the worship service and for Sunday school, Sunday evenings for [her] Girls Auxiliary and [my] Royal Ambassadors [for boys], Wednesday evenings for prayer meeting, and Friday evenings for fellowship time. At Christmas time, our fathers focused sermon series and lessons around the baby Jesus and the Great Commission for the Lottie Moon Christmas offering to support the Cooperative Program for worldwide missions. At Easter time, the focus was on the post-passion resurrected Jesus, who preached the Great Commission. At any rate, we saw Jesus films. Last night, we were watching television, flipping through the channels, and I came upon The Passion of the Christ, one of the most gruesome of the many bloody scenes. But I kept going. My wife asked, rhetorically, poking at deep feelings within me that Southern Baptist preachers kids and missionary kids share: Are you really going to flip through this sacred scene to that comedy show? I’ve seen the Jesus film in the village at Easter enough, I think, I said. Based on the Gospel of Luke, the “JESUS” film has now been translated into more than 1,120 languages, with new languages being added every month. This allows God’s Word to speak to people in more than 200 countries in languages they know and understand. There’s this assumption, right or wrong, that if you just get someone to watch, then they will in all likelihood perpetuate this 1 decision per every 8 seconds. And at Easter, that rate might just increase additionally and exponentially. What bothers me about this as much as anything is the suggestion that film watching is all one should do, that the film will capture the essence of Easter, that the response that must be right is this “decision to follow Christ.” The assumption that a film will push anyone into any decision is bothersome, like propaganda is. And yet, learning about Passover or Easter or Pentecost might better involve the literary rather than just the evangelical Christian missionary filminess. The warning to Bible readers, who feel pushed by cultural Bible pushers, may nonetheless be this: you might stop reading the Bible for the wrong reason, just to avoid being pushed around. So please do read anyway and please just be prepared to be surprised without expectation. I just love the title of Theophrastus’s post we just read: “Ends and beginnings”! Why must there be the finality of this one decision as if that’s it and that’s the only tradition that counts? Well, I just read Annie Dillard again. 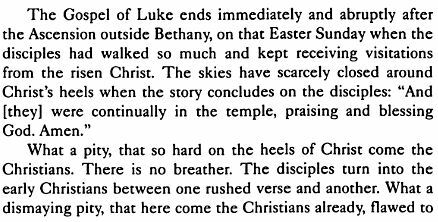 I’m compelled after reading Dillard’s reading of one of the gospels, her essay entitled “The Book of Luke”, on this Good Friday, to end this post with it. It’s in some ways a beginning for me, another reading from my own experience. Let it be, perhaps, a beginning for some of you, as you like. Historians of every school agree – with varying enthusiasm that this certain Jewish man lived, wandered in Galilee and Judea, and preached a radically spiritual doctrine of prayer, poverty, forgiveness, and mercy for all under the fathership of God; he attracted a following and was crucified by soldiers of the occupying Roman army. There is no reason to hate him, unless the idea of a God who knows, hears, and acts – which idea he proclaimed – is itself offensive. In Luke, Jesus makes no claims to be the only Son of God. Luke is…. This idea of coming to the story via a book or books rather than through movies puts in mind some of my evangelical friends who are big on the various “Christian” movies and speakers – the gospel transmitted through some kind of performance rather than reading and contemplation. It’s not all bad; it did start as an oral tradition after all. But sometimes as the number and type of these hollywood-style “church friendly” movies seems to proliferate in their focus-group-friendly fashion, one feels the sense of that “What a pity…” in the last passage you quoted – where is that essay from, anyway? Thanks for your comment, Gary! You are on to something comparing the transpositions and media, and yet behind these whether movies or books or oral story telling is the intention of the production that can be most problematic. There’s the assumption that viewers will be magically transported into a state of belief that recruits them into a once and for all decision to “follow” Christ in His mission then to recruit more recruits. 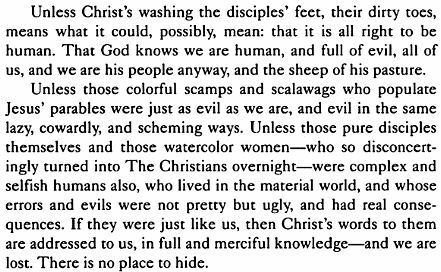 In 1994, Dillard published The Annie Dillard Reader, and that’s where I found the essay quoted from above; she is showing how difficult “The Book of Luke” can be. And I dare add that the Greek gospel does not show “followers” of Jesus believing in him or his resurrection easily. Luke 24:45 makes us read – τότε διήνοιξεν αὐτῶν τὸν νοῦν τοῦ συνιέναι τὰς γραφάς – which is a moment of oral speaking by Jesus with his followers in which they look together at what is written, moving towards an “open mindedness” that seems not so gullible as in a brain washing but more studied as in a midrash and as in a Socratic dialectic. Is that what Christians leaders seek? To recruit believers on the basis of a long-form commercial? I would have thought that the quality of belief was at least as important as quantity of believers. Other religious groups (for example most Jewish communities; Roman Catholics) normally require a potential adult proselyte to take classes and better understand the nature of the religion before admission to the religion. I am pretty sure that in these cases, the Book was better than the film. Perhaps, somewhere, someplace, a stained glass window inspired a convert. But certainly she was not admitted to the Church on the basis of admiring the colors in that window alone. At the very minimum, it would seem that conversion requires a commitment that goes beyond watching a TV show. Thanks for your excellent questions, Theophrastus. Notice how with the trademark talk, there’s discussion of the brand, the logo, and the advertising. This summer, when the SBC meets, there will be a vote on whether to adopt the new name “Great Commission” without legally changing it from “Southern.” What’s prompted this is the declining numbers in church membership and the difficulty church planters face, especially in the USA in the South, where the pro-slavery history of the denomination is well remembered. I understand. But the religious education of children or of the adult faithful is a separate question from the education of potential proselytes. In particular, with a proselyte, there is a very real question of whether she understands the commitments of the religion she wishes to affiliate with. If she does not then in many religions there is a question of whether her conversion was valid or is automatically nullified. This certainly was a historical problem with certain Christian missions to indigenous or non-Western peoples, for example. I do not know whether the SBC currently permits adult to be baptized involuntarily. A nice little, white little, missionary stew! The issues you raise about proselytizing by surreptitious means and how invalid conversions under false pretenses and misrepresentations might be are important very important issues. They are important not just for Southern Baptists or any group showing the Jesus Film. But they are also crucial issues to be discussed about any religious group that would seek to bring in new members. Although the churches in the report you link to share the name “Baptist” with SBC churches, I must say that they are very different in their beliefs and practices from most SBC churches. While SBC churches operate independently, by and large, they are not like these two, “Independent, Fundamental, King James Only.” Generally SBC churches never ever force post-conversion baptisms although the public ritual may be strongly pushed as a requirement for local church membership. A person entering a new religion or denomination subjects herself to special laws: regarding tithing, marriage, sexual conduct, diet, required participation in communal prayer, etc. Perhaps in America, this does not matter, because religious bodies have no effective way to enforce most of these laws, but it has a moral impact. Further, to the extent that a religion has a mandatory theology, it seems incumbent on the church to teach at least the basics of that theology to its prospective members. but one can see that the citizen requirements, at least in theory, are supposed to educate new citizens as to what they are signing up for. I hope that new SBC converts — whether they are formally baptized or not — understand what they are signing up for. Wow, Theophrastus. There’s a lot here to unpack. First, let me say that nobody feels these particular issues as deeply as an SBC PK/ MK. By PK I mean “preacher’s kid” and by MK “missionary kid.” We PKs and MKs are not afforded a choice about which faith community we are born in and are raised in. The church and the world watches to see whether the SBC pastor’s children are going follow Christ or fall by the wayside. The world and the church that the SBC FMB (or IMB) MK lives in, when there’s a transition back to the USA, is not an easy world to find oneself in. (For very complex reasons, two of my buddies when we were undergraduate students after growing up on the mission field decided to take their own lives commiting suicide because of the difficulties. I watched and listened to the surviving parents of both of my dead friends grieve, and how they did. These are not easy issues for those of us who haven’t entirely chosen them.) My own siblings and my spouses siblings, now as adults, still are working out issues related to being MKs and PKs in the SBC. * On the one hand you state that SBC de facto policy is that adult converts make an informed conversion (at the age of accountability). * On the other hand this post started by quoting a web site: “Every eight seconds, somewhere in the world, another person indicates a decision to follow Christ after watching the ‘JESUS’ film.” And that very web site has a picture of young children raptly staring at a screen. I am having trouble reconciling this statements. I understand that The JESUS Film is sponsored by the Campus Crusade for Christ, which is distinct from (but often coordinates with) missionary activities by SBC. So maybe this is just a denominational difference. You speak very eloquently on the issue of children born into a strong religious culture; particularly when the parents of those children are prominent in the religion business. You give a powerful witness to the real stresses faced by the children of clergy and missionaries. There is, though, a silver lining to be born into a religion. With being born into a religion comes a certain freedom to seriously critique that religion. A convert’s position in a religious community is often a bit uncertain; unlike well-established believers, she may feel social pressures to conform to the most orthodox elements of the religion to prove that her conversion was true. But a cradle believer’s membership in the religious community is already usually established by religious law — with a few notable exceptions (e.g., Mormons) formal excommunications are fairly rare in most communities. For example, the last prominent Jew to be excommunicated was Baruch Spinoza, and heaven knows that he was not the last skeptical Jew! Thus a cradle believer has a certain authority and freedom not available to the proselyte. If I think of the great religious reformers (I’ll mentioning John Calvin and Martin Luther — both originally devout Catholics — in Luther’s case, even a monk and a priest), they tend to come from within a religion more often than than from without. My post was a response to your post on Ends and Beginnings and to Victoria’s and to Courtney’s comments. Unfortunately, I wrote all too quickly. The “Jesus” film is in my post a synecdoche for all of the Jesus films I’ve seen. Jesus, or “the ‘Jesus’ film” as it’s called on the website I quoted from, was actually produced long after the “fall of Saigon.” When my family lived in that city, 1968 – 1969, I believe I watched Jesus films for the first time. My father had taken the assignment of director of the Radio/TV/Film ministry for the SBC Foreign Mission Board’s Vietnam Baptist Mission there. In the back of our house, there was a media studio where he worked. He also let us come in after school and, of course, watch. The Jesus movies were played by Euro-American or European actors, who spoke dubbed-in Vietnamese or English with Vietnamese subtitles. It was much later, toward the end of the war, and further north, when my brothers and I watched people in villages watch these same movies. In my post, I probably should have made clear that the famous and ubiquitous “Jesus” film (the one Bill Bright of Campus Crusade made) is not the one I grew up with, although I’ve seen it too. I’ve seen that Jesus film not only in English and in tiếng Việt (Vietnamese) but also in Bahasa Indonesia and in Batak Karo (respectively, the official language of Indonesia and the village language of the Batak people of the Karo tribe, who adopted my parents into respective clans; my parents were in Indonesia, in North Sumatra, as missionaries, after the war ended in Vietnam). I’ve started to watch it in Mandarin, which is a language my parents studied in retirement as they worked with Chinese in the USA. So although I didn’t grow up with this one, although it’s not SBC, there it is in my post. By the way, this same film has a children’s version, a version with an “Old Testament” introduction to more contextualize the life of Jesus in a way that the book of Luke does not, a September 11 version, and an apologetics version on DVD with viewer controlled segments on various topics by experts who are there to refute the skeptics. Online and audio only versions are available too. The claims for “Cumulative Exposures/Decisions Since 1979” are “more than 6 billion” viewers as the “Audience” and “more than 200 million” viewers who “Indicated decisions for Christ following a film showing.” Sigh. I’m out of breath. 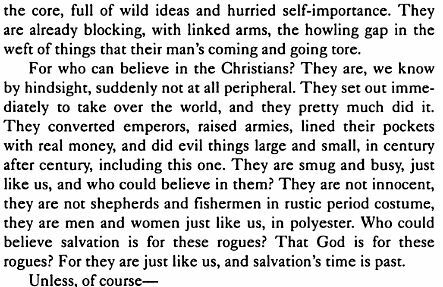 You are kind in your observations about us “children born into a strong religious culture [whose] parents … are prominent in the religion business.” I confess that two of my very favorite novels are Barbara Kingsolver’s The Poisonwood Bible and Chaim Potok’s My Name Is Asher Lev. They probably present less of the silver lining in their protagonists that you so astutely mention here. 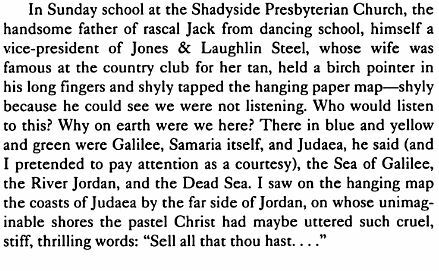 I also confess writing – for a Ph.D. literature course in early American captivity narratives – a seminar paper that is my own narrative of captivity; but captivity, I wrote, by missionaries. (The fun irony there is that many of the authors of such narratives were early missionaries to the New World who were captured and held in captivity by their intended converts, and the stories of the freed captives were advertisements to their missions of the Providence of God in the midst of the challenges of evangelism. For me, I failed to make much of the silver lining, although my story itself of course is an insider’s critique.) You mention Jack Chick, whose tracts may “critique” Catholicism and many other Others; but I don’t think he’s at all an insider of any of those groups he lambastes. On his publication’s website, the biography for him says “he has always had a special burden for missions and missionaries.” I’d never realized that until today. Also I didn’t realize he was inspired by propaganda, that he believes God so inspired him: “One day, Bob Hammond, missionary broadcaster of The Voice of China and Asia, told Jack that multitudes of Chinese people had been won to Communism through mass distribution of cartoon booklets. Jack felt that God was leading him to use the same technique to win multitudes to the Lord Jesus Christ.” My wife and our siblings know these Chick tracts very well – popular youth group leader materials for the youth, even in the SBC churches. The tough thing for SBC PKs and MKs is that born again and born into the family are so blurred. Sorry for going on so long here. I’ll be thinking about Spinoza and Calvin and Luther in a new way for a long time because of your comment, I’m sure. Kurk, so many thoughts and images — they all come tumbing together in your above comment. I’ll have to think about what you are saying carefully to respond. Here I will limit my comments to one little detail — to avoid any confusion: I did describe Jack Chick above as an outsider. Even though Jack Chick and Hans Kung both criticize the Vatican, we put someone like Jack Chick and Hans Kung in different categories, in part, because Chick is an outsider (a hate-monger) and Kung is an insider (a dissident priest and theologian).